Hardly any nowadays business can survive, let alone prosper, without utilizing IT in one way or another. And for a good reason! Information technology is the source of great benefits and a tool that makes so many tasks take less time and be less wearisome. Besides, lives of modern people are ever more tightly bound with their devices and the internet, which creates innumerable opportunities for new businesses that use IT properly. Alas, following the trend is not always so easy, especially when it is as potentially resource-consuming and demanding as IT. This is particularly true in regard to small and medium businesses. SMEs, because of their flexible structure and lack of spare resources, are usually among the first companies to try implementing tech innovations and benefitting from them. At the same time, they have to be cautious to avoid the threats accompanying IT. Today, we are going to discuss these issues and learn how to defend against them. Obviously, there are more than just these 3 problems. But the ones we are about to cover are by far the most common and conceivably dangerous. This problem is arguably the most hazardous of the three. Small and medium business usually can’t hire a full-fledged system administrator that would establish a security system and set up various protective measures. As the result, most businesses decide to operate completely unprotected, risking their hard-earned money. Some of them plan to bring in a sysadmin later, when they have sufficient budget. Which oftimes doesn’t happen until a major breach or a cyber assault occurs (read – until it’s too late). What the owners of such businesses don’t realize is that there are two general types of cyber attacks – targeted and global. The former are notably more efficient and dangerous, and it is this type that you need a full-time system admin to protect against. However, such attacks are significantly more costly as well and are commonly applied against international corporations or governments. Common SMBs are unlikely to become their victims. Global attacks are a whole different story. They are relatively cheap and easy to organize, and can reach numerous targets within a short period of time. This makes global attacks especially devastating against targets with no protection. Luckily, they become less effective, the more security measures the targeted company utilizes. Among the safety tools that are exceptionally effective in this case are VPNs, such as Business VPN by KeepSolid. Combining data encryption and IP concealment technologies, they provide top-grade online security at an affordable price. Unless we’re talking IT SMEs, most small businesses start with little to no IT experience. At best, they have a single, narrowly focused tech specialist. Not only can this situation cause the aforementioned security issues, it also means numerous problems in the future. Let’s say your business is successfully growing. You will soon see the need to increase your online coverage, or expand to other platforms, or integrate new tools and services for your operations. These and many other arising technological needs are positive signs of a business’ natural development. However, you will need an IT professional who knows how to answer these calls and meet the emerging challenges. Otherwise, they will in no time become a burden at first, and a sink for valuable resources later. Avoiding such an outcome should become a top priority for any SMB owner. This can be achieved in a number of ways. If you feel that your company’s IT needs will keep growing, it’s best to simply hire a relevant IT specialist. However, their salaries can sometimes be unyielding for young enterprises. In this case, or if you believe that your need for IT is only temporal, it’s best outsourcing your company’s IT tasks to special tech agencies. The third option is to nurture your own specialist by staff training. This is the best choice in terms of cost and reliability, but takes more time, which makes it out of the question in some situations. For a new business, establishing contacts is everything. It has to get in touch with suppliers, set up communication with vendors and partners, and, finally, reach its potential customers. After this initial stage comes an even more complicated part – to preserve and improve these relationships. While technologies certainly make this task easier than it used to be, say, 20 years ago, it still comes with its pitfalls. Alas, the solution for this issue highly depends on the communication channels your business is using. We can only provide some generalized advice in this case. For instance, remember to install a strong writing etiquette (be it by email or messengers) in your company from the very start. Time of response to customer inquiries is also essential, as no one would like to receive a however perfectly-written reply days after the initial request. Among other communication hints is replacing expensive business trips with video chat services to keep a face-to-face presence while cutting the costs. Finally, it’s not uncommon for modern businesses to go mobile under BYOD principles. In this case, the use of Business VPN is also recommended, as it will share the VPN’s protection and privacy benefits between all your workers, regardless of the device they’re using. All in all, we hope this article helps you figure out your business’ most vulnerable spots. 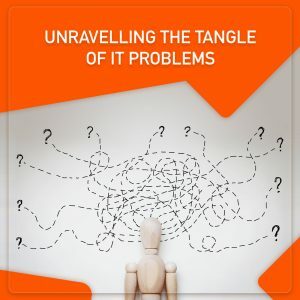 The issues we’ve described may feel overwhelming at first sight, but the benefits of IT for enterprises are just too valuable to ignore. As always, nothing ventured – nothing gained, and in this case the gains are tangibly greater than the risks. The key is to not allow the issues stack up and to address them in a timely manner. If you want to address two of the above issues at once, download Business VPN by KeepSolid and get 7 days of a free trial to see its efficiency for yourself!